For the unrelated Latin pop album, see Chiquitita (album). For the soap opera, see Chiquititas. (1979) "Does Your Mother Know"
"Chiquitita" (a Spanish term of endearment for a woman meaning "little one") is a song recorded by Swedish pop group ABBA. It was released in January 1979 as the first single from the group's Voulez-Vous album. Originally, the track "If It Wasn't for the Nights" was going to be the album's lead single, but after "Chiquitita" was completed those plans were abandoned, and it would remain an album track. Many preliminary versions of "Chiquitita" exist. It had working titles of "Kålsupare", "3 Wise Guys", "Chiquitita Angelina" and "In The Arms of Rosalita". A revised version, which had a sound that was influenced by the Peruvian song "El Condor Pasa (If I Could)" performed by Simon and Garfunkel, was recorded in December 1978 and released as a single in January 1979. With the success of the English version, ABBA also recorded "Chiquitita" in Spanish by phonetics, and it was one of the featured tracks on the Spanish-language release Gracias Por La Música. "Chiquitita" proved to be one of ABBA's biggest hits. It was featured in a 1979 UNICEF charity event, the Music for UNICEF Concert, broadcast worldwide from the United Nations General Assembly. As a direct result of this event, ABBA donated half of all royalties from the song to UNICEF. "Chiquitita" hit #1 in Belgium, Finland, Ireland, the Netherlands, New Zealand, Spain, Switzerland, Mexico, South Africa and Rhodesia, and was a Top 5 hit in ABBA's native Sweden, the United Kingdom (peaking at #2 in both countries where Blondie's "Heart of Glass" was occupying the top spot), Australia, Germany and Norway, making it the most successful single from the Voulez-Vous album in terms of global charts and one of the most famous charity songs ever. To this day, 50% of the proceeds from the song go to UNICEF in recognition of the "International Year of the Child" in 1979. 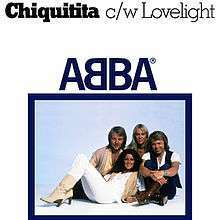 In the United Kingdom, "Chiquitita" debuted at #8 in the singles chart, making it the highest place début for any ABBA single release. "Chiquitita" was one of the very few singles ABBA released without a custom-made video. Since then, on compilations of the group's videos, a contemporary TV performance of the song has been used. This clip was taped by the BBC for the show ABBA in Switzerland, broadcast across Europe at Easter 1979. ABBA is seen performing the song on a mountainside, with a snowman in the background. Throughout the clip, there was an obvious problem with the fan during filming, which affected Anni-Frid Lyngstad; her hair constantly flew in her face, and she was forced to keep moving it out of her eyes. Live cover performances, appearances in other media, etc. The song is performed in the Mamma Mia! musical and film by the characters of Tanya and Rosie. In the context of the musical, Donna has been surprised by the arrival of the three possible fathers of her daughter, and the song is used by her friends in order to comfort her and to find out why she is so upset; in the film they have to coax her out of hiding. It is one of three songs not to be featured on the official soundtrack. Leona Lewis performed the song on the British TV show The X Factor. "Chiquitita" was used as the opening song for the Japanese drama Strawberry on the Shortcake. It was used in episode 2.04 of Queer as Folk at the end. Charo performed the song at her 1988 concert in Reno at Bally's. Stephen Gately recorded his version for the Abbamania: Tribute to ABBA album in 1999, and the ABBA - Forever album in 2004. The famous Hungarian female singer Harangozó Teri sang the Hungarian Radio studio recording version in 1980. On 20 November 2014, Laleh Pourkarim performed the song live during a UNICEF event in New York City. Sinead O'Connor sang "Chiquitita" on the 1999 album "Across the Bridge of Hope". She also recorded a music video for the song. ↑ "ABBA - In The Arms Of Rosalita Lyrics". Moodpoint.com. Retrieved 2016-10-14. ↑ "Abba – Chiquitita". YouTube. Retrieved 29 July 2011. ↑ "Argentina". Home.zipworld.com.au. 2013-06-02. Retrieved 2016-10-14. ↑ Downey, Pat; Albert, George; Hoffmann, Frank W (1994). Cash Box pop singles charts, 1950–1993. Libraries Unlimited. p. 1. ISBN 978-1-56308-316-7. ↑ "Harangozó Teri - Chiquitita". YouTube. 2015-08-25. Retrieved 2016-10-14. ↑ "Ulvaeus och Laleh i FN" (in Swedish). Svenska dagbladet. 20 November 2014. Retrieved 25 November 2014. ↑ "Sinead O'Connor - Chiquitita (Official Video)". YouTube. 2009-03-08. Retrieved 2016-10-14.